به دنبال توافق تاریخی هسته ای ایران با غرب در ۲۳ تیرماه ۹۴ و بر داشته شدن تحریم های یکجانبه اقتصادی غرب علیه ایران و حضور دوباره شرکت های چند ملیتی در ایران، شرکت های ایرانی با فشار رقابتی بسیار شدیدی مواجه خواهند شد که این رقابت قوانین و قواعد بازی بازار را به طرز شگفت انگیزی تغییر خواهد داد. در پس هر تهدیدی یک فرصتی نهفته است. شرکت های ایرانی می توانند از این فرصت خارق العاده برای افزایش قدرت و توان رقابتی خود از طریق استراتژی های جهانی، الگوبرداری، ایجاد ارتباطات قدرتمند بین المللی، انتقال دانش مدیریتی غرب و …. بهره مند شده و تهدیدات را به فرصتهایی برای پیشرفت کسب و کار خود تبدیل نمایند. دوره تخصصی ۱ یا ۲ هفته ای مهارت های کسب و کار در کشور مهد مدیریت و اقتصاد، انگلستان برای مدیران موفق ایرانی طراحی شده، تا آموزش های نوین مدیریتی را توسط اساتید برجسته این کشور به صورت تئوریک و عملی به مدیران ایرانی، منتقل نمایند. در کنار آموزش مباحث مدیریتی، اساتید دوره می کوشند تا دانش زبان انگلیسی مدیران ایرانی را افزایش داده و این عزیزان آماده حضور در عرصه تجارت بین المللی شوند. من و تیم SLS ایران، در این مدت تلاش کردیم تا بهترین بستر آموزشی و به روز دنیا را برای مدیران ایرانی مهیا نماییم. امیدوارم این عمل سبب پیشرفت دانش مدیریت و کسب و کار کشور عزیزمان ایران شود. SLS فعالیت تخصصی خود را از سال ۱۹۷۵ (بیش از ۴۰ سال) آغاز نموده است. هر ساله تعداد زیادی از مدیران موفق کشور های مختلف جهان در دوره های آکادمی SLS ثبت نام کرده و دانش مدیریت و زبان انگلیسی خود را افزایش می دهند. و بسیاری مزایای دیگر …. جهت ثبت نام و کسب اطلاعات بیشتر به با شماره ۰۹۱۲۰۰۶۸۱۰۹ و ۰۲۱۸۸۲۱۳۰۲۸ تماس حاصل نمایید. SLS (Specialist Language Services) works exclusively with business and professional people providing intensive tailor-made one-to-one and group courses. Our courses are completely tailored to the individual or group needs and produce exceptional results. At SLS (Specialist Language Services) we are so confident in our ability to deliver, we are prepared to guarantee all our tailor-made courses. Your comfort and enjoyment during your time at SLS (Specialist Language Services) is a priority for us. We like to offer whatever help we can with your individual requirements. We can arrange a taxi to meet you at your arrival destination to take you to your accommodation. Many of our course participants choose to stay with one of our host families while they are with us. This is a great arrangement, combining the benefits of home cooking and a comfortable environment with plenty of opportunities to speak English! Each family is personally approved by SLS (Specialist Language Services) and we endeavour to provide an environment in which you will feel comfortable by finding out a little about you – your interests, whether you smoke, if you would be happy around children or pets. Accommodation includes breakfast and evening meal on weekdays with full board at weekends, plus transport to our Executive Training Centre each day. Many participants strike up lifelong friendships with their host families and it makes their time at SLS even more memorable. Accommodation is not included in the course price. If you prefer, we can arrange for you to stay in a hotel. We are able to recommend a number of hotels in York and can accommodate all budgets. Cost of transport between your hotel and SLS (Specialist Language Services) is not included but can be arranged on request. Please contact us before or during your stay if we can be of any further assistance. Many businesses choose SLS’s one-to-one courses, which are completely tailored to individual needs, or our group courses which also offer exceptional results. SLS (Specialist Language Services) Premier courses are an excellent way to learn, with intensive, one-to-one training totally focused on your individual business objectives. These courses achieve excellent results with our participants frequently giving the maximum overall score on their course evaluations. The focus is entirely on your specific language needs, with the opportunity to practise English in situations you typically have to deal with. That’s why we encourage participants to bring examples of work-related tasks such as a presentation, a project plan, or an agenda for a meeting with them. Our group courses offer the opportunity of taking part in a Jobtalk programme at SLS (Specialist Language Services) or specialised group courses on your company’s premises. The courses are based on realistic business situations and provide an ideal environment for participants to improve their English skills in for example group discussions, telephoning, and presenting in front of a group. Business people are increasingly aware of the need to be able to communicate fluently and confidently in English and SLS (Specialist Language Services) exists to equip you with these skills. 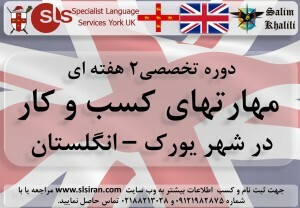 SLS (Specialist Language Services) is a well-established and highly respected training provider. We are specialists in equipping business professionals with the English language skills they need in order to work more effectively. Corporate clients around the world choose us because they know that the quality of our courses is guaranteed and that we provide a professional, efficient and friendly service. Based in York, our Executive Training Centre is dedicated exclusively to business people. At SLS (Specialist Language Services), we like to do things a little differently, which is what sets us apart from our competitors. The SLS (Specialist Language Services) profiler is at the heart of what we do and enables you to see the added value that we bring throughout your training experience. All our courses are customer-focussed, starting with pre-course consultancy and ending with a post-course assessment and follow-up. In our initial discussions with you we establish your specific training needs and help you select the most suitable training option. We work in partnership with you to deliver English language training which is not only interactive and engaging but also results-driven. We understand that you want to be able to track the results of your learning experience, so we have developed the SLS (Specialist Language Services) Profiler to show the value added by our one-to-one courses. The SLS (Specialist Language Services) Profiler helps to ensure that the course is driven by you, the participant. It facilitates a clear understanding of your precise training needs and enables us to deliver a tailored course to meet those needs. You will be asked to give your own assessment of how effectively you feel you perform your job in English at the start of the course, how you feel at the end of the course and again three months after your SLS (Specialist Language Services) course has been completed. The SLS (Specialist Language Services) profiler is at the heart of what we do and enables you to see the added value that we bring throughout your training experience. The SLS (Specialist Language Services) dedicated training centre provides a friendly and professional atmosphere in which to learn. Our participants tell us they enjoy the professional and friendly atmosphere at our training centre. Our training rooms reflect a modern business environment. Our instructors combine the latest technology including meeting facilities and internet access – with proven training methodology to provide high impact courses. Every training room has a full multimedia PC with broadband access and each participant is given a personal e-mail address. Participants are welcome to bring their own laptops and take advantage of our wireless internet connections. The centre has areas for relaxation, with complimentary drinks in our comfortable lounge. Break times are ideal opportunities to practise English conversation with other participants and instructors. We also provide a range of English language newspapers and magazines – it’s all a learning experience and one that we are sure you will enjoy! Refreshments are available throughout the day. Please note that in line with UK legislation, smoking is not allowed inside our buildings. The excellence of the SLS (Specialist Language Services) courses is matched by our superb location – York. York is a fantastic place to visit, full of history and surrounded by beautiful countryside. The city has something for every business person away from home – museums and galleries to absorb the local culture, a vibrant nightlife with a huge choice of restaurants and bars and great shops for those essential presents to take home. Whether you are staying for a week or more, York’s historic city walls, Minster and ancient streets will leave you with a lasting impression of this lively city. York is easy to reach and is half way between London and Edinburgh. You can fly to Manchester, Leeds, Newcastle or London and come by train or taxi. You can also come by car and take the ferry to Hull or Newcastle. We want to make your stay in York as enjoyable as possible and we believe that having fun is part of the learning experience! We arrange optional evening and weekend activities to show you the sights and give you opportunities to socialise. We cater for all tastes, from ghost walks to theatre trips, go-karting to tours of York’s world-famous Minster. Please click the image below to download a copy of the SLS sales brochure.